So, I was listening to Pandora (internet radio) recently. Specifically, I was listening to my own radio station "Victoria's Vault" that I started almost exactly four years ago. I've been finessing my station for so long now, with those "like" and "dislike" buttons, that I've gotten it down to a nice blend of progressive rock, alternative rock, and some moody acoustic/indie artists and instrumental offerings. I know that sounds like a weird mix, but it really does work. When it suggests a song or band I haven't heard of before, or that I didn't "seed" my station with, I will usually think it's just okay or passible, but every now and then, Pandora will strike gold. A few weeks ago Pandora played the song "Bloodstream" by the British band Stateless and I was over-the-moon and completely hooked. I downloaded the album and I simply can't. stop. listening. to. it. Stateless is, for want of a better description,an electronic alternative rock band with hip hop, classical guitar and electronica dance influences. That makes it sound like a hot mess (and definitely not something that I would instantly be drawn to), but it really is something to be heard. Today, gentle readers, I'm giving you a three-for-one on this Musical Interlude, because I couldn't decide which video to link to. "Down Here" is my favorite song and video, but "Bloodstream" seems to be their big hit now (thanks to being featured on the show True Blood). And, if you only watch one video, be sure to click on "Ariel" to see the trippy motion-capture special effects they used. Do you use Pandora? What band/artist have you discovered as a result of Pandora or another internet radio service? Be sure to leave me a comment and let me know. I'm always on the hunt for new ear candy. 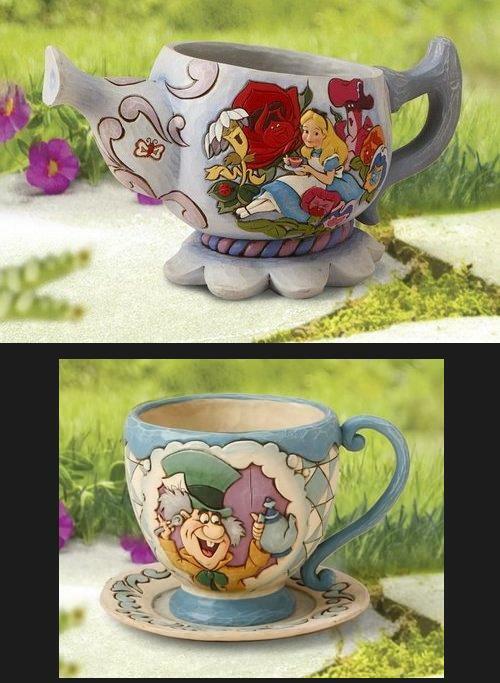 Still image taken from Disney's Alice in Wonderland. A couple weeks ago, I wrote about my brief dream to have an Alice in Wonderland themed garden, with giant teacups serving as flower planters. The reality of living in an area where nothing grows but cactus pretty much stomped out that dream. What hasn't changed is the fact that I still have a terrible case of Spring Fever. The weather outside is beautiful, everyone is talking about spring break vacations and plans for Easter. So, I'll continue to feed my need for a pretty flower garden by virtually creating one. ﻿First, we'll have a little stone path, leading along the side of the house and up to the wooden gate, where you see this little "Welcome" sign sticking up in the grass, letting you know that you're entering Wonderland. You might have to push aside some overgrown bright pink bouganvilla to reveal a strange and wonderful little garden oasis. There, lining a lush and manicured grassy lawn, you'll see beds of purple and yellow pansies turning their faces up to the sun, bushes of ruffly peonies, rows of pure white tulips, peach Jacob's Ladder roses climbing along the brick wall, proud irises of every color holding their heads high above the smaller flowers. Oh and we simply must have fragrant lilac bushes, with their pretty little lavender flowers perfuming the air. There will be a small reflecting pool (the Pool of Tears, of course) with lily pads and lush green vegetation surrounding it. Maybe we need some trees too, like a big weeping willow with its branches arching over the pool, providing some shade. In the dark recesses of the bushes and in amongst the exposed roots of the tree, there will be white and orange mushrooms pushing up through the dirt. As you keep walking along the path, you'll come to some beautifully manicured rows of deep burgundy roses. There will be iridescent blue butterflies alighting here and there on the flowers and, if you look closely, you'll see the White Rabbit running in between the bushes on his way to his appointment. He's very late, for a very important date, you see. Speaking of the White Rabbit, maybe we should have a vegetable garden too, in addition to our flower garden? We would definitely have carrots for the White Rabbit, as well as lettuce, strawberries and cucumbers. We could also have tall stalks of smiling yellow sunflowers. The sunflowers would bring birds to our lovely garden, and we'd want to be hospitable, so we should provide a birdhouse of some kind. 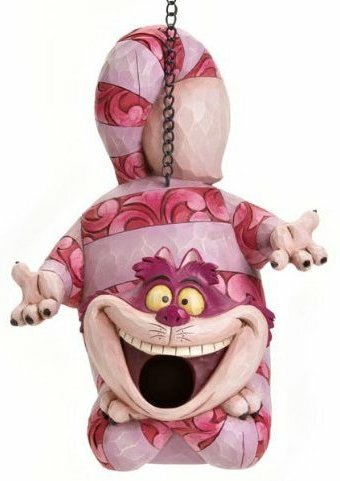 Although I don't think the belly of the Cheshire Cat is what you would call being "hospitable". Still, I have a feeling this particular cat is harmless and would give them a good home, as he swings by his tail from the limb of a tree. And that, dear readers and fellow adventurers in Wonderland, is what I would put in my imaginary garden. What's in your (real or imaginary) garden? What are you going to plant for Spring? Desert flowers and plants can be pretty too; so if you live in the Valley of the Sun like me, let me know what your favorite one is. Have you ever had one of those moments where you stumble across a musical act or piece of art or literature, and wonder to yourself, "Where have I been this whole time, that I'm just now finding out about this?" Well, that's the reaction I had when I first heard Florence + The Machine. Although, to my defense, she's a new artist, having only released one album (Lungs) in 2009. And now, you too, will be in the dark no more, as I introduce you to her fabulousness. The "band" consists of English singer Florence Welch and various studio session musicians and guests artists providing support. It's hard to describe her musical style, but I suppose I would call it eccentric pop/rock with a little soul thrown in too. All I know is, from the moment I heard her first song, and promptly downloaded the album, I've been unable to stop listening to it. Two songs in particular are my favorites: "The Drumming Song" and "Rabbit Heart (Raise It Up)", however, I'm going to feature "Rabbit Heart" here, because of the Alice in Wonderland and fairy tale references, both in the song's lyrics and in the music video. So far, I've identified references to: Alice in Wonderland, Greek mythology (i.e. the Three Graces, King Midas), the Bible, the Lady of Shallot, Ophelia, fairy tales, and Pre-Raphelite paintings. It reads like a list of all my favorite things! They've disabled the video embedding feature, so just click on the image below and it will take you directly to the video on You Tube. Be sure to watch/listen to "The Drumming Song" too. What new music have you discovered recently? Leave me a comment and let me know. 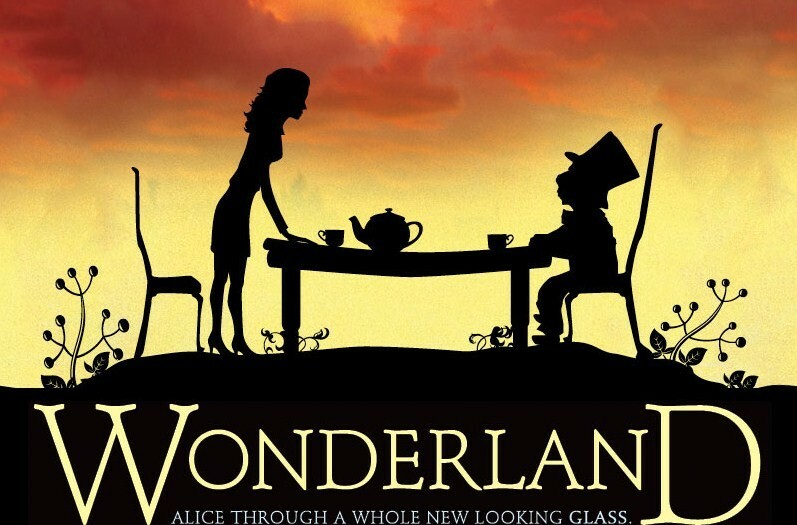 Alice has been through the looking glass, visited wonderland on the silver screen, traveled through American McGee's video game adventure and went back down the rabbit hole with Tim Burton, but I don't think she's ever been to Broadway... until now. There's not much at the official website for the musical, but here's an Associated Press article that describes the role reversals, costumes, and alternate interpretations. Looks like it will be set in a Wonderland underneath New York City and the costuming and setting will be modern, and Alice will be an adult. 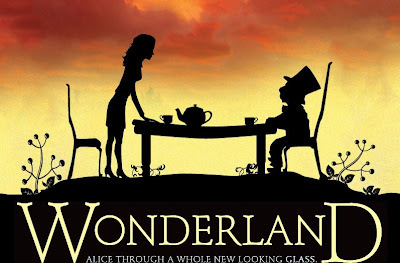 I love "re-imaginings" of Wonderland and variations or new takes on the theme, but I'm not sure how I feel about all this, since I'm not really a fan of musicals. However, I love it that, all these many years later, Lewis Carroll's imagination and the world and characters he created continue to inspire artists and spur more creativity. If this production ends up touring and coming to my town, I just might have to see it. What do you think? Do you like Broadway musicals? Do you like "re-imaginings" of classic stories, or does it bug you when they don't stay true to the original? So, I went to my first fan convention this past weekend. (I know, big surprise to you that I'm a geek and a nerd. Shocking.) I attended the Wild Wild West steampunk convention in Tucson, AZ. I will probably write more about this later, but for now, I thought I'd share some of the music from the event, since it's Musical Interlude Monday. Then there were the Dusty Buskers. (Clever name, huh?) They are a local Tucson group that plays old-time folk and bluegrass music. They aren't strictly a steampunk group, but they fit in just fine. This isn't the best quality video but I used it because it was actually filmed at the Tucson con. You can listen and see more by going here. And last but not least, there was another popular steampunk group - the all-steam powered robot band called the Steam Powered Giraffe. Again, the video quality isn't the best, but I chose to use this because it was filmed at the Tucson con. Be sure to check out their other videos, because these guys really are quite funny and extremely talented. When I was in Walmart recently I turned down an aisle and suddenly thought I'd dropped into Wonderland. Or if nothing else, that I had taken a sip from a "Drink Me" bottle and shrunk in size, because the shelves were filled with giant tea cups with saucers and giant tea pots. Giant teacup planters from Baum, found on Amazon.com. The scope is lost on these pictures, since there's no frame of reference, but they are huge. They were the size of a large mixing bowl or punch bowl and were built with drainage holes in them so they could be used as garden planters. They gave an entirely new meaning to the term "flower pot". When I was standing there in the aisle, I was struck with visions in my head of a beautiful Alice-themed garden with Japanese paper lanterns strung across my porch and roses of every color and snapdragons springing forth from these teacups, and maybe even a little statue of a white rabbit tucked in the bushes somewhere. Then I remembered I live in Arizona, where the summers are like living on the surface of the sun, and anything that isn't a cactus is burned to a brittle brown husk, and the dream died. But it was a fun dream for the brief moment I had it. When I was searching online for a photo of the giant teapot (which I couldn't find) I came across this ingenious garden decoration you see to the left. It's called a Rain Chain. The idea is, when it rains, the water will pour through the opening in the top of the teapot, weave in and out down through the chains and into each teacup, like a decorative water fountain, only powered by a rainstorm. I immediately fell in love with it, (which should be no surprise, given the name of my blog,) however, I don't have a spare hundred dollars lying around. And it doesn't hardly ever rain here, so the poor thing would go unused. So, my dreams of a flower garden will remain in my head and I will be content with my cactus. What about you, Gentle Readers? What's your favorite thing about your yard or garden? Leave me a comment and let me know. Today (February 26th) is National Tell a Fairy Tale Day! I couldn't let this day go by without giving it a mention, considering my absolute love for fairy tales and storytelling. 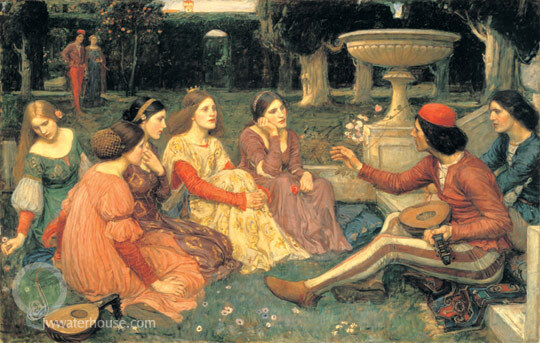 According to Wikipedia, a fairy tale is a type of short narrative that typically features such folkloric characters as fairies, goblins, elves, trolls, dwarves, giants or gnomes, and usually magic or enchantments. However, only a small number of the stories thus designated explicitly refer to fairies. The stories may nonetheless be distinguished from other folk narratives such as legends (which generally involve belief in the veracity of the events described) and explicitly moral tales, including beast fables, although a moral lesson is usually conveyed. Back in the day, when I used to babysit, I would make up fairy tales and tell them to the kids. It was the only way I could get them to go to bed. Of course, I firmly believe that fairy tales aren't just for children. So, here are a few suggestions on ways you can celebrate today, whether you're around little ones today or not. Read a fairy tale out loud to your kids or your favorite friend. This is a no-brainer and the whole point of the holiday. Read one of the original Grimm's fairy tales. You'll be surprised at how different they are from the Disney versions. Go to a book store or library and check out some of the current fairy tales. Thankfully there is a small group of modern authors who enjoy writing in the genre and even re-telling or finding new twists on the old themes. Make up a story with your kids. You don't have to be an author. It doesn't have to be perfect. I just saw the film The King's Speech last night and there was a wonderful scene with the king making up a story on the spot to tell his two daughters before bedtime. Such a sweet moment. Play dress up with your kids. Part of fairy tales is imagination, so dress up in some fun costumes and let your kids help you make up the story collaboratively or they can act out the story as you read it. So, what's your favorite fairy tale? Leave me a comment and let me know. May you find a fun way to celebrate imagination and storytelling today and may you live happily ever after! A Very Merry Un-Anniversary to Alice! Today I'd like to wish a very merry un-anniversary to Disney's Alice! To celebrate the 60th anniversary of the release of Alice in Wonderland, Disney has released the film on Blu-Ray this month. 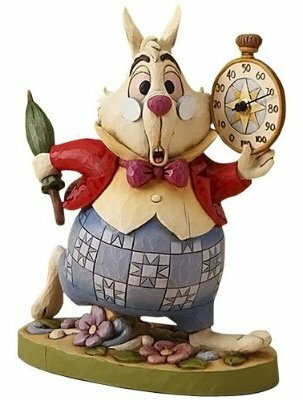 Disney's Alice was orignally released on July 28, 1951, so that's why I called this post an un-anniversary, because the actual date is in July. 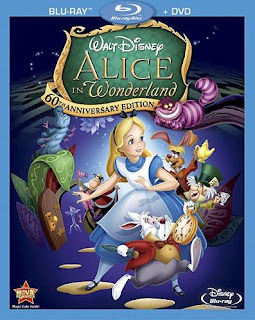 Lewis Carroll's stories don't easily lend themselves to the cinematic treatment, but I think Disney took the best of both stories and combined them in a way that was faithful to the original works and celebrated the wit and silliness of the characters and wonderland, as well as Alice's plucky personality, yet made it more approachable for a wider audience. Not only that, it was some of the most stunning animation that Disney has ever produced, under the art direction of Mary Blair. What's odd is that Alice was probably one of the most negatively reviewed and criticized films in the Disney cannon, especially during its original release. Most of the criticism came from Lewis Caroll devotees, literary purists, and British critics who accused Disney of "Americanizing" the story. To celebrate this un-anniversary, I thought I'd provide some fun diversions for you, on this lazy Friday afternoon. Below is a list of links, with more information about the film, as well as a list of the Blu-Ray special features, and even a link to some crafts and coloring pages for your kids (or for you, if you're a big kid). Cheers! An overview and fun facts about the film can be found at the Disney Archives site here. Click here to watch a "making of" video discussing the creation of the Alice soundtrack. Click here to see preview clips of the Blu-Ray version of the film. Below is a list of the special features included on the Blu-Ray. o Through the Keyhole: A Companion's Guide to Wonderland - View the movie in this special mode and discover references to the original Lewis Carroll classic - introduced by the voice of Alice, Kathryn Beaumont.